Iranian Oil Tanker collides with Chinese Freight Ship in the East China Sea. 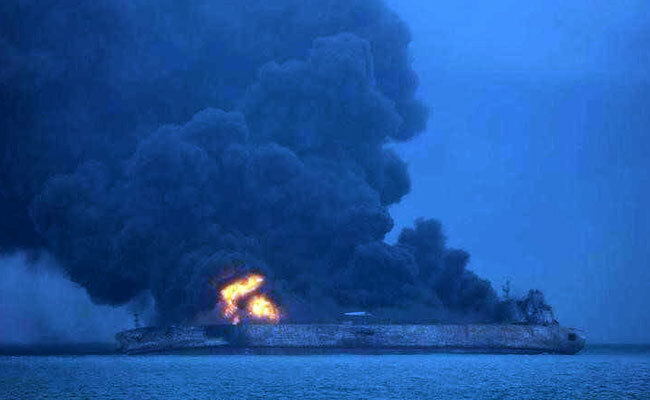 Thirty-two people, mostly Iranians, were missing after an oil tanker collided with a cargo ship off China’s eastern coast, authorities said on Sunday. The missing – 30 Iranians and two Bangladeshis – were all from the Iranian tanker Sanchi, which was carrying 136,000 tonnes of oil condensate. It spilled oil and was floating while still on fire early on Sunday. Images broadcast by the Chinese state TV channel CCTV showed the ship in the grip of an intense blaze, enveloped in clouds of black smoke. The other vessel, the Hong Kong-registered freighter CF Crystal, had been damaged but “without jeopardising the safety of the ship” and all of its 21 Chinese crew had been rescued, China’s transport ministry said. The Panamanian-flagged 274m long Sanchi was operated by Iran’s Glory Shipping and was heading to South Korea with its cargo, the ministry said. The accident occurred about 160 nautical miles east of Shanghai. Chinese maritime authorities dispatched eight ships for the search-and-rescue operation, and South Korea sent a plane and a coast guard ship to help, the official Xinhua news agency said.